African-Americans have been murdered by white mobs, vigilantes, and “law enforcement” from the time of slavery to, quite possibly, this morning. 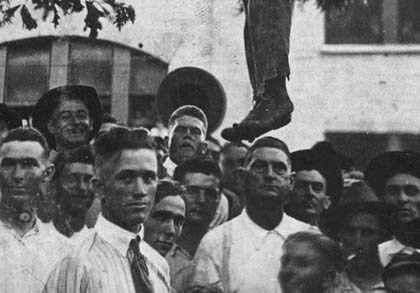 The fundamental reason for the killing of African-Americans by whites has been fear by many whites of all classes that the existing rules of racial hierarchy, that is, white supremacy, are endangered–whether by slave uprisings, Blacks threatening white job monopolies, taking political power from whites, moving into white neighborhoods, undermining their monopoly on white women by allegedly having “intimate relations” with them, or simply seeming insubordinate. In the June 17, 2015 Charleston, South Carolina church shooting, the 21-year-old assassin Dylan Roof apparently melded these fears into one, common among many klansmen and neo-Nazis (an overlapping category) as well as segments of the Republican Party, that the entire white race is in danger of being diminished if not extinguished by racial minorities. This view extends to some anti-immigration groups. “Lynching,” often with the participation or collusion of police and occasionally even the armed forces, resulted in the deaths at minimum of 4,000 Blacks in 12 Southern states from 1877 to 1950, according to the Equal Justice Initiative in Montgomery, Alabama. These events include “pogroms” in which whites invaded and destroyed Black neighborhoods as well as “border wars” when whites resist Blacks “invading” so-called “white” areas to integrate housing or to utilize “white” public facilities. Charles M. Blow, in his N.Y. Times Op-Ed column, attacked the sloppy use of the term “lynch mobs” by politicians and others who have compared protesters against police killings to “lynch mobs.” Recall that during the confirmation hearings on the nomination of Clarence Thomas for the U.S. Supreme Court, he termed the charges of sexual harassment made against him an attempted “legal lynching.” Blow, in trying to overcome this dishonesty, cites a recent historical survey of actual (not metaphorical) “lynchings” stating that 4,743 persons including not a few whites (and probably some Native Americans and Asians) were “lynched” between 1882 and 1968. There are several problems with this. Three or more is an arbitrary number, and of course three people are hardly a “mob.” The definition excludes many racist murders committed by one or two persons, as in the case of 14-year-old Emmett Till, murdered in Mississippi in 1955 after a woman accused Till of whistling at her. Her husband and a friend kidnapped him, shot him, and dumped his body in the Tallahatchie River. What of Herbert Lee, an NAACP activist shot to death by a Mississippi state legislator acting alone, in 1961? Dylan Roof, the Charleston church shooter also seemingly acted as a “lone-wolf.” There have been countless others. Second, this definition does not address the many “disappeared,” where there is no “legal evidence” of a murder. During the hunt for the three missing Mississippi Freedom Summer volunteers after they were killed in June, 1964, other bodies, missing for weeks or even years, were found. In her new book Racial Reckoning, Oberlin College history professor Renee Romano provides the histories of 38 murders in the South from 1951 to 1968 chosen from among least 200; an Arkansas research center counted 53 in Mississippi alone from 1955-1970. Many of Romano’s cases are familiar: In the case of Emmett Till, an all-white jury acquitted the two killers who were in effect acting as vigilantes “defending white womanhood.” No arrests were made in Herbert Lee’s shooting even though there were witnesses, one of whom, an African-American, was himself killed to keep him quiet. Jimmie Lee Jackson was shot by an Alabama State Trooper in Marion, Alabama on February 26, 1965 following a civil rights march. The trooper was not even reprimanded. This shooting is depicted (with a slight change in locale) in the film Selma. Also depicted in the film is the September, 1963 Birmingham, Alabama church bombing that killed four girls aged 11-14. That case and many others were reopened years later, as Romano recounts, due to campaigns initiated by members of the families of the deceased and other civil rights veterans as well as by a tiny handful of local white prosecutors. Although most white-on-Black racially motivated killings took place in the states of the former Confederacy, there were racist murders in many other states over the years. Nor were Blacks the only victims. After 11 Italian-Americans had been acquitted of a murder in New Orleans in 1891, a mob broke into the jail and lynched them. It is estimated that between 1885 and 1915 some 50 Italian-Americans in states from Louisiana to New York were murdered because of their ethnicity. “Lynch mobs” do not always lynch in the literal sense. A typical “pogrom” took place following a union meeting of Black sharecroppers in Elaine, Arkansas on September 30, 1919. The meeting (protected by armed guards) was attacked by 500-1,000 armed whites. By the time it was over on October 2, more than 200 Blacks and 2 whites had been killed and numerous Black-owned homes and businesses destroyed. Union members were arrested and two were sentenced to death. All convictions were reversed by 1925. Another pogrom took place in Tulsa, Oklahoma in May, 1921, triggered by rumors that a white woman had been attacked by an African-American man. A white mob invaded the Black neighborhood of Greenwood; despite a defense by armed Blacks, some 1,500 Black-owned homes and a prosperous Black business district were destroyed and 10,000 left homeless. Some 300 died. The pogrom was finally halted only after martial law was declared. Another pogrom, the Detroit “race riot” of June, 1943 was set off when a white sailor’s girlfriend was allegedly insulted by a Black man. A white mob looted and burned Black-owned stores; 25 Blacks and 9 whites were killed, 17 of the Blacks by police. By contrast, most civil rights era murders were not committed in the course of a pogrom or by lynch mobs, i.e. crowds mobilized by some incident such as an arrest of an alleged violator of racial tradition, then breaking into the jail and “taking the law in their own hands” by hanging him or her in open view of hundreds or thousands. Typically, the murders of the 1950s, 1960s, and later were committed by individuals or small groups of organized vigilantes, often klansmen and their friends acting “under the pretext of service to justice, race or tradition,” and often with the passive or active participation of local sheriffs or police (many of whom were klan members themselves). Vigilantes act when there is a perception that the normal course of law cannot or will not protect the traditional ways of the community, which in the South meant segregation in all of its dimensions. There are also numerous cases where Blacks were randomly shot down by passing motorists without any apparent motive except bigotry, which is itself often the product of fear. The Charleston Emanuel African Methodist Episcopal Church murders have once again reminded us of the vulnerability of African-American churches. They have been targeted by klansmen and other racists for, literally, centuries. 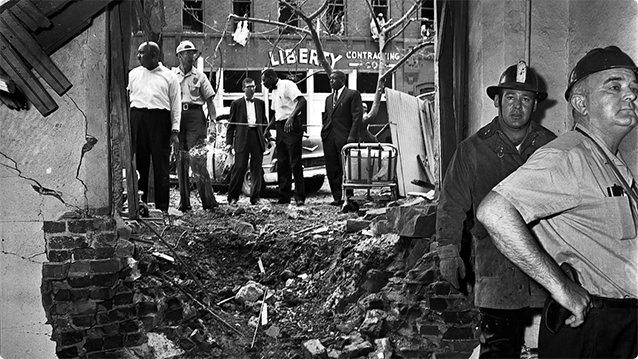 The 1963 Birmingham church bombing was perhaps the most notorious of many attacks. The Mississippi Freedom Summer volunteers James Chaney, Andrew Goodman and Mickey Schwerner were murdered after they had been investigating the arson of the Mt. Zion United Methodist Church near Philadelphia, Mississippi. The aftermath of the 1963 Birmingham church bombing. Nor did church arson cease after the 1960s: there was a rash of attacks in the late 1990s so intense that President Bill Clinton formed a National Church Arson Task Force, which identified 225 attacks on Black churches between 1995-1998 alone. A number of church fires came in the wake of Charleston and the resulting Confederate flag controversy. Some have been declared to be arson. Although homicides other than by police are fairly accurately tabulated, we actually do not know how many “ARDs” (Arrest Related Deaths) there are. The Bureau of Justice Statistics estimates that its ARD data cover only 28-49% of deaths, depending on different ways of collecting data.4 The Wall Street Journal (December 12, 2014) found that “hundreds of homicides by law enforcement agencies” were missing from FBI figures. Many deaths are simply not reported. Some police departments don’t supply data to the FBI. As for officially-recorded ARDs, about two-thirds are classified as homicides. The others include illnesses, suicides, and real or alleged accidents such as that of Freddie Gray last April in Baltimore. Between 1999 and 2011, conservatives are quick to point out, official data show 2,151 whites versus “merely” 1,130 Blacks were killed by “legal intervention,” meaning police, sheriffs, deputies, security guards, etc, demonstrating supposedly that the police are not racist.5 In fact, although more whites were killed in total, Blacks aged 20-24 were killed in vastly disproportionate numbers, about 7 times the average for all races. Native Americans aged 25-34 were next, at about 6½ times the average, with Blacks aged 25-34 at nearly 6 times the average. Latinos are also killed in disproportionate numbers. The numbers of official deaths holds pretty steady year by year, although given the increase in population, it could be argued that the rate of police homicides is declining. These figures bring us back to the major factor underlying the history of African-American deaths at the hands of whites: fear. Police shooters commonly defend their actions by saying they feared for their lives, even when the victims were unarmed and running or driving away. How can we account for this? One excuse has been that the police are poorly trained and use force unnecessarily. No doubt this is a factor. However, media coverage has overlooked another issue. There is a lot of research on “the police personality” going back many years, although controversy remains.6 Many police share certain traits with many of the working class (both white and Black) from which they are disproportionally recruited, especially a tendency towards a rigid black/white, good/evil moralistic view of the world, and a punitive attitude towards those who violate conventional values. This attitude becomes cemented by the fact that police have “more contact with the seamy side of life than most people.” Research indicates that officers (including Blacks) evidence more prejudice when they work in African-American neighborhoods than when they work in mixed or white (and less poor) areas of a city. Their politics on the average tend to be conservative, partly because liberals select themselves out of the recruitment pool. One result is the continued stereotyping of the Black male as potentially dangerous no matter in what situation–as when even a Black Harvard professor attempting to enter his own home is viewed as a possible criminal and arrested, as happened to Henry Louis Gates in July 2009. Gates is relatively short and walks with a cane, and was hardly a threat. It is unlikely that attitudes deeply rooted in family upbringing and reinforced by “continual exposure to the very worst in life” as a cop can be changed to any significant degree. The good news is that since the publicity over Ferguson, and with the help of increasing numbers of smart-phone camera users, police killings that used to be hidden are now in the open. Today each case of a police shooting is much more likely to see the light of day, even though the police are nearly always (so far) exonerated. As the Black Lives Matter movement continues to gain traction, reforms in police practices such as police body cameras, and banning shooting at moving cars or at people running away, are taking place. Nevertheless, lest such reforms languish, pressure by community groups and their progressive allies cannot be allowed to diminish. And parents may still probably want to have “that talk” with their African-American youngsters. The Charleston church murders put the spotlight on the continued presence of ultra-right-wing, racist organizations, which for the most part are also anti-immigrant. Even the various klans of the South survive. Dylan Roof seems to have had some connection to the Council of Conservative Citizens, an outgrown of the segregationist (white) Citizens’ Councils. Several Republican figures, mostly from the South, quickly distanced themselves from their former support for the Council. Nevertheless, years of research by “watch-dog” groups indicate that “the political right is arrayed along a continuum,” rather than being sharply distinct from the “ultras.”7 This continuum shares the fear that the white-dominated status quo is in danger. “Mainstream” conservatives find their ideological home in a set of think tanks and policy planning organizations that provide their talking points. These groups, such as the Heritage Foundation, the American Enterprise Institute, and the Pioneer Fund, are in turn supported by dozens of corporations. Black Lives Matter and other grassroots anti-racist organizations understand, in a general way, that the murders of African-Americans over the years (and the ideologies behind them) are rooted in a system of oppression that requires repressive institutions and practices to survive. This system includes the “prison-industrial complex,” discriminatory policing, surveillance of progressive organizations and individuals, and biased media coverage. This culture of oppression has been tolerated by too many people much too long. Martin Oppenheimer is emeritus professor of sociology, Rutgers University. His doctoral dissertation was on the 1960 sit-in movement, in which he was a “participant-observer.” This article appears in the September-October issue of Against the Current. Robert K. Murray, Red Scare: A Study of National Hysteria 1919-1920, McGraw-Hill 1955, 182-189. Jeffrey Haas, The Assassination of Fred Hampton, Lawrence Hill Books 2010. FBI Uniform Crime Reports 2012, Expanded Homicide Table 6. Human Rights Data Analysis Group Report on BJS Statistics March 4, 2015. Center on Juvenile and Criminal Justice, “Who Are the Police Killing?” August 26, 2014. A good summary is in Robert W. Balch, “Police Personality: Fact or Fiction,” Journal of Criminal Law and Criminology, v. 63 No. 1 Article 10 (1972). See in particular The Public Eye, publication of Political Research Associates. An excellent analysis is by Chip Berlet, in v. XVI No. 1 (Spring, 2002), not outdated except that some organizations have become defunct or have changed their names. For an overview of right-wing extremism, see Oppenheimer, The Hate Handbook, Lexington Books 2005, chapter 5.